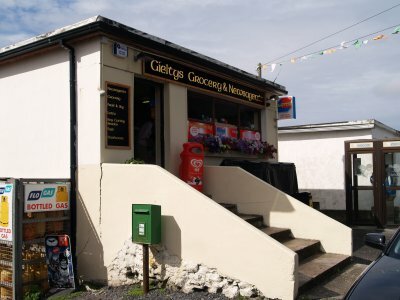 'Gielty's Empire' - 'The Clew Bay' pub, 'The Last Drop Cafe' and Gielty's Village Store for groceries and newspapers. 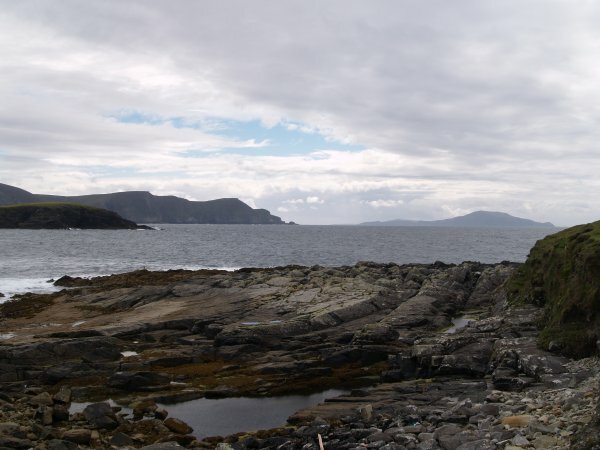 View from Dooagh Village to Clare Island in Clew Bay. 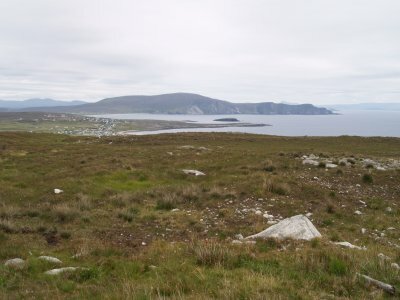 Looking down to Dooagh Village from the reservoir. 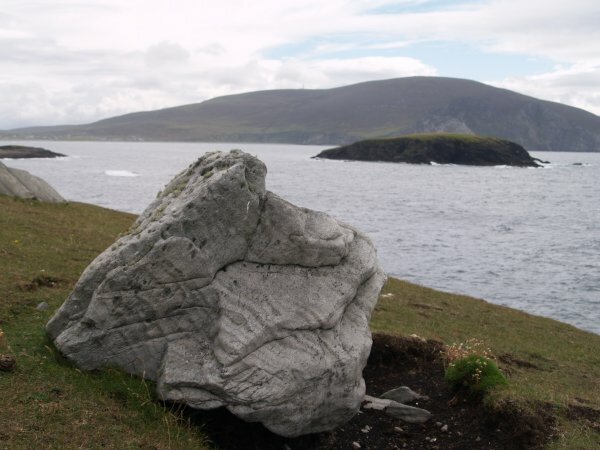 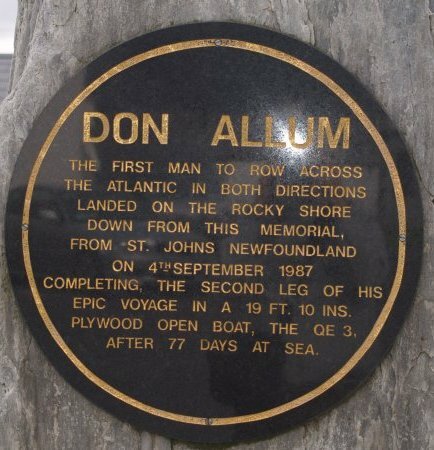 In the centre of Dooagh village a stone and plaque commemorates the achievement of Don Allum who was the first man to row the Atlantic Ocean in both directions. 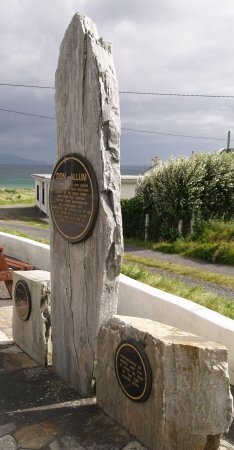 He landed on the rocky shore of Dooagh's stony pebbled beach on the 4th September 1987 from St John's Newfoundland, thus completing the 2nd leg of his epic voyage in a 19 ft 10 ins plywood open boat (the QE 3!) 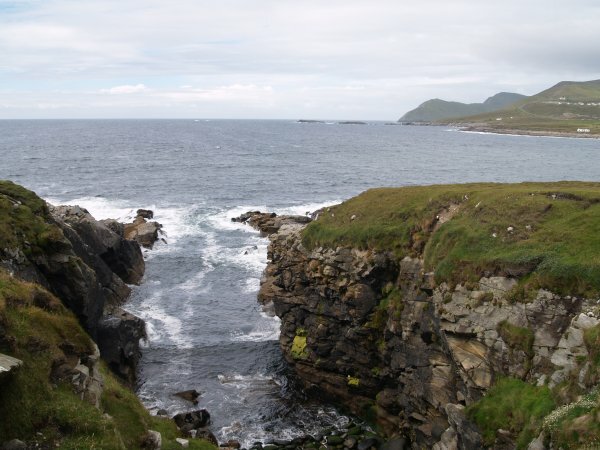 after 77 days at sea - remarkable voyage! I bet he was ready for a drink at "The Pub"! 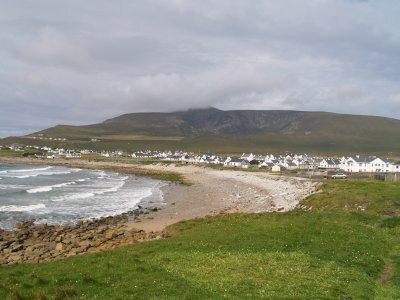 Dooagh Beach and the white houses of the village with the backdrop of Croaghaun- Mountain in cloud again! 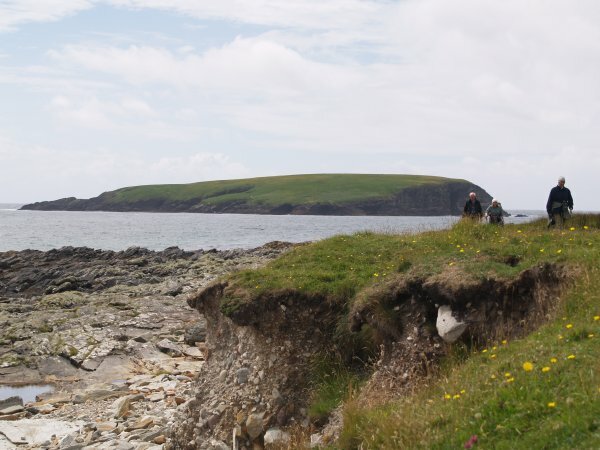 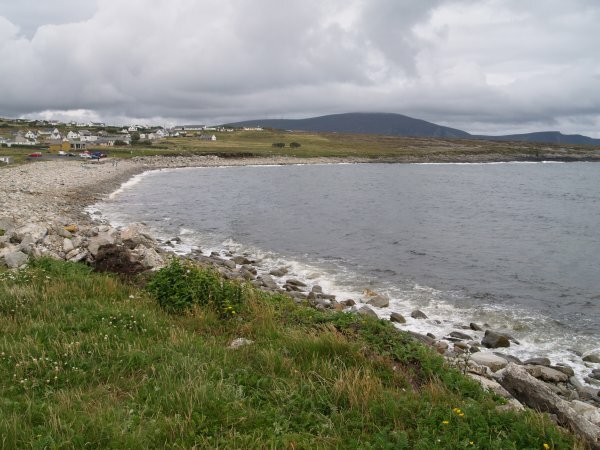 The 'gang' walks along the seashore east from Dooagh towards Keel Strand. 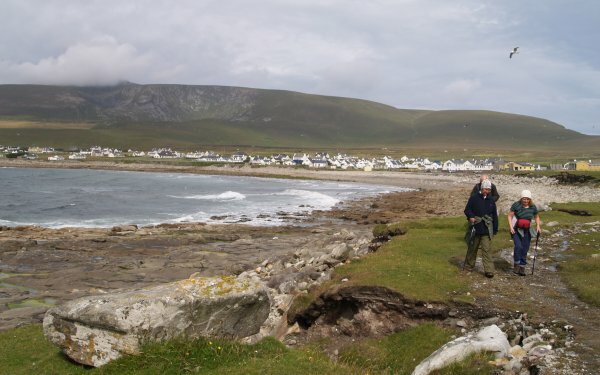 Lots of little inlets carved out by the bashing of the Atlantic waves. 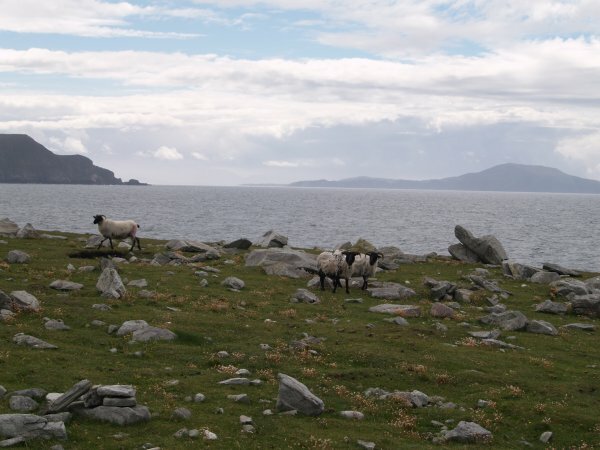 A few sheep, plenty of rocks and Clare Island in the distance, viewed from near Dooagh. 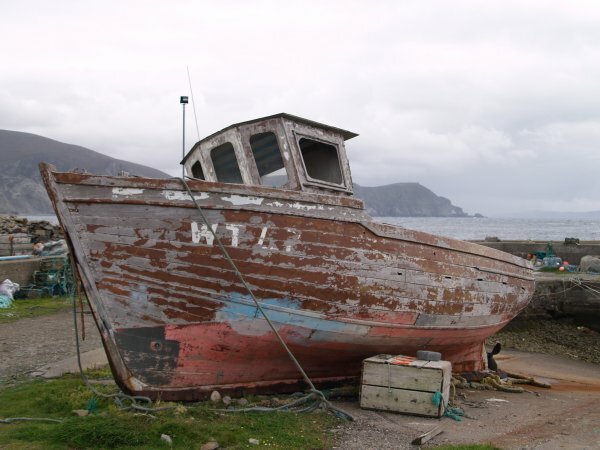 Some of the boats have seen better days! 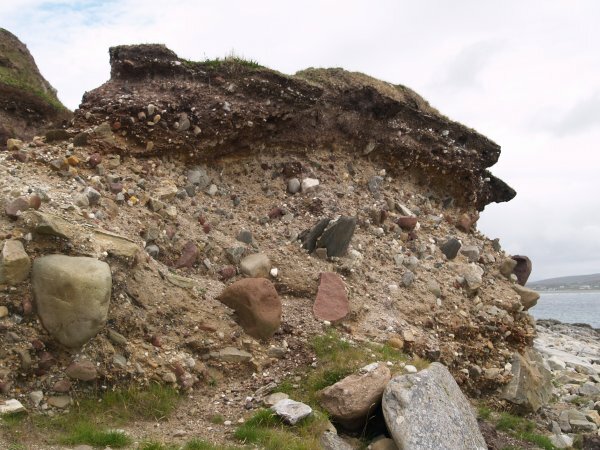 Sedimentary layers from glacial deposition. 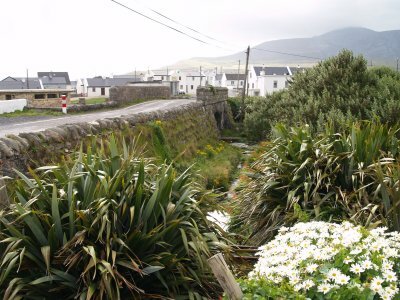 Keel village coming into view.
? 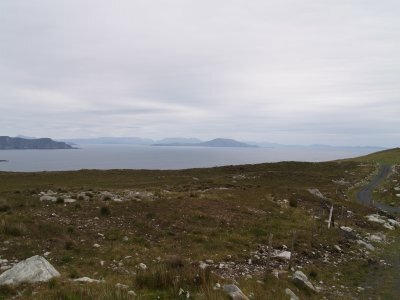 Island in the background. 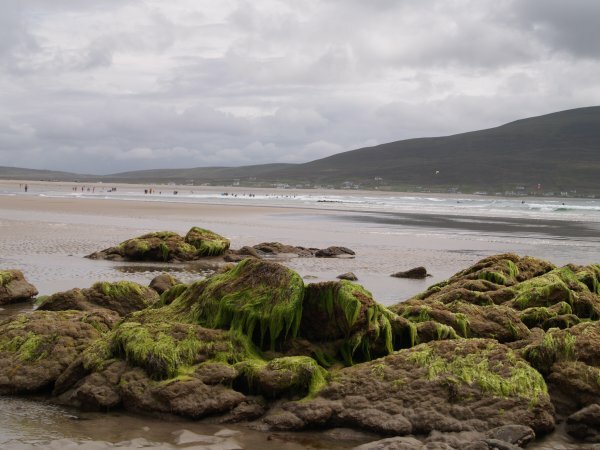 Keel Beach or Keel Strand - which ever you prefer! 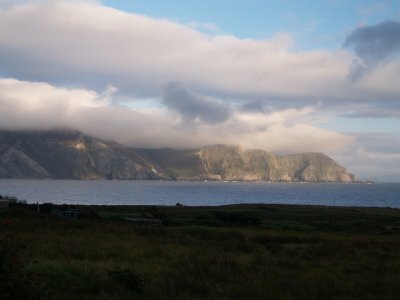 Slievemore in the early evening, view from our holiday cottage in Dooagh. 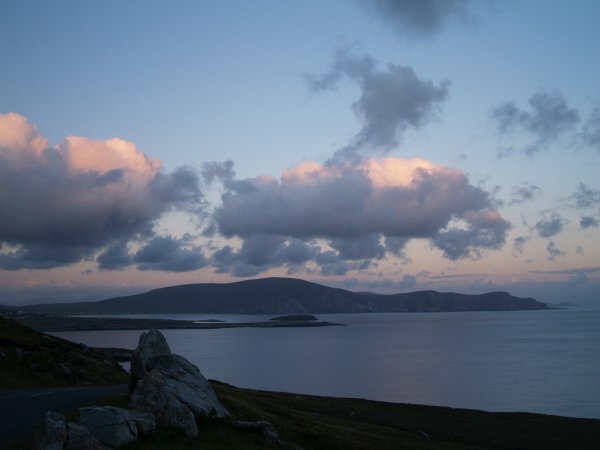 Evening light from above Dooagh village. 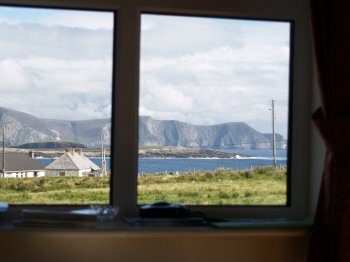 The views from our holiday cottage in Dooagh, not bad ! 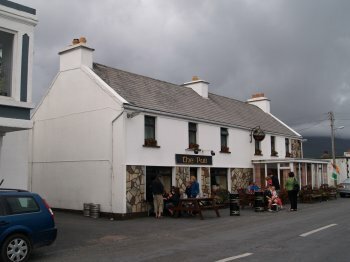 Dooagh Village, Achill Island, Co. Mayo, West of Ireland: The Pub (top left) in the centre of Dooagh Village on the south side of Achill Island, Co. Mayo. 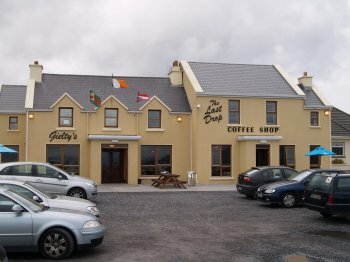 'Gielty's Empire' (illustrated below) - 'The Clew Bay' very friendly pub, 'The Last Drop Cafe' and Gielty's handy Village Store for groceries and newspapers. 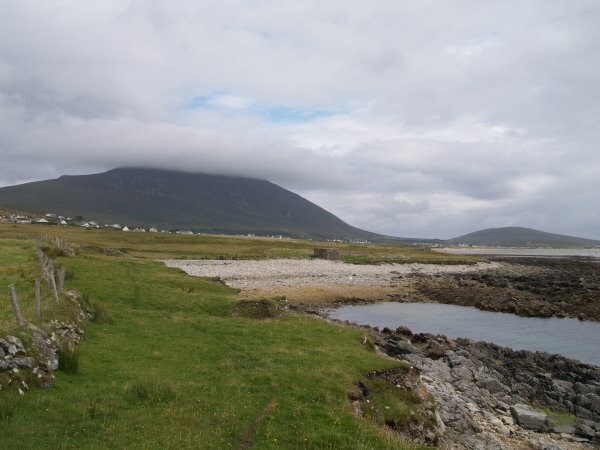 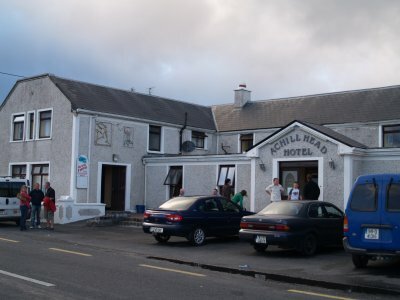 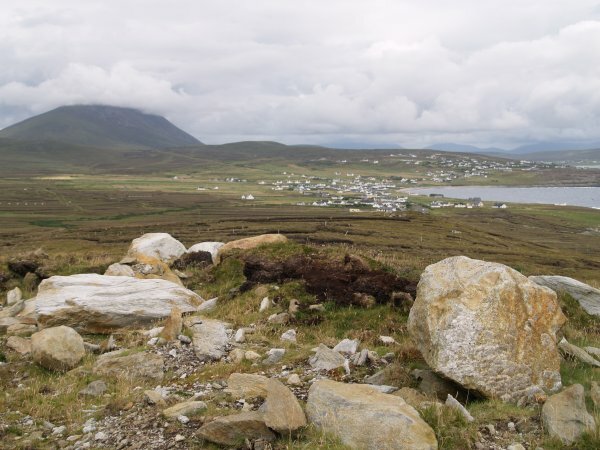 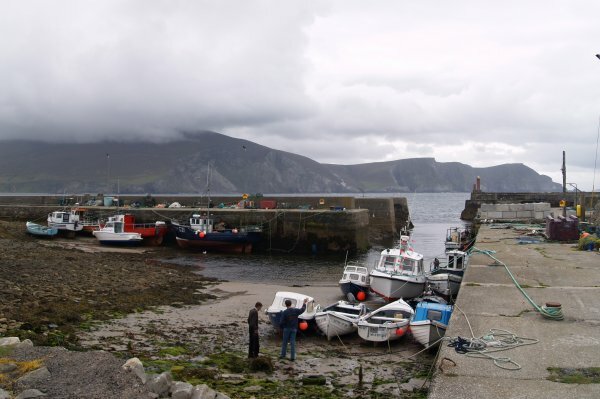 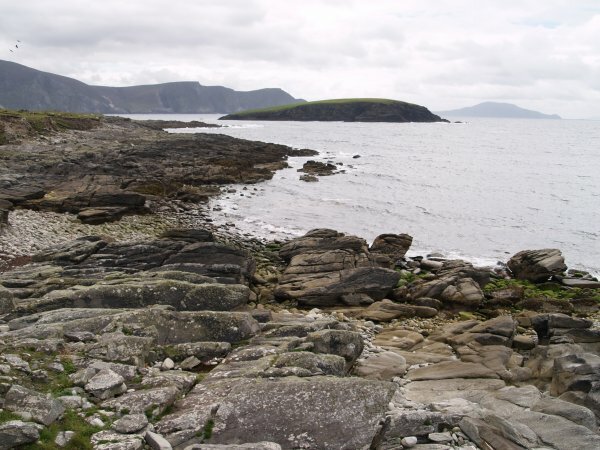 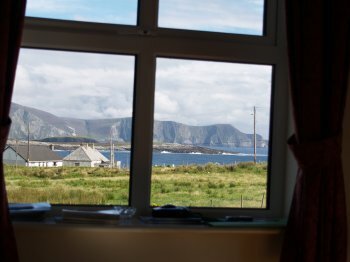 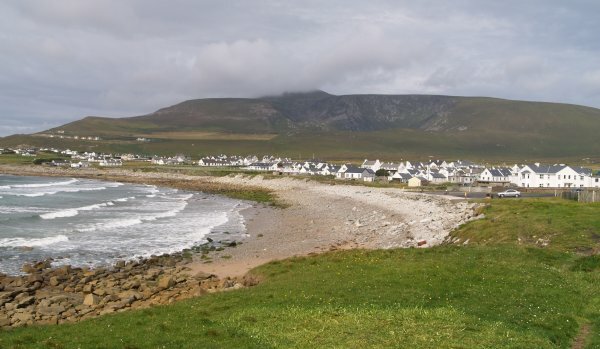 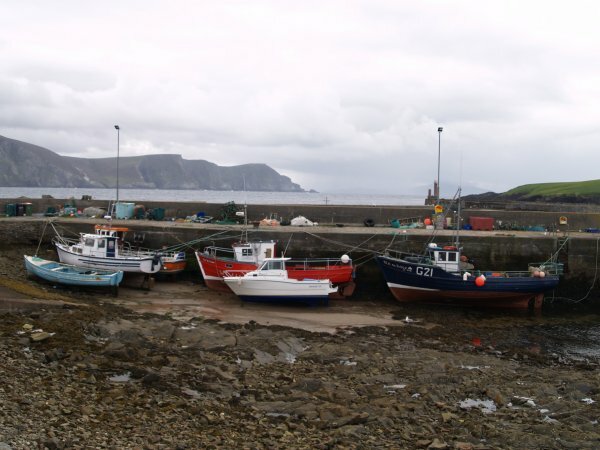 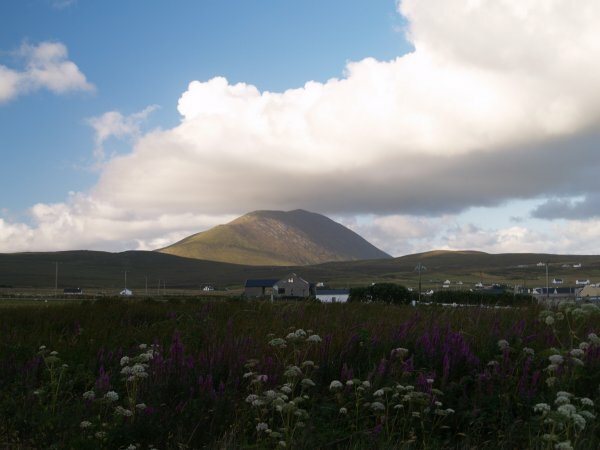 Further along the road eastwards is Achill Head Hotel with magnificent views out over the sea. 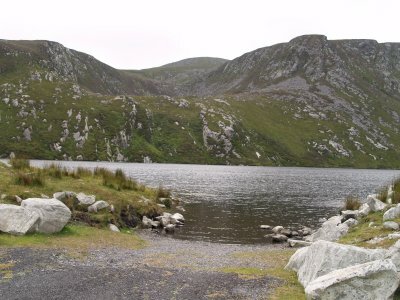 Lough Acorrymore, above Dooega, Achill Island, Co. Mayo, Ireland. 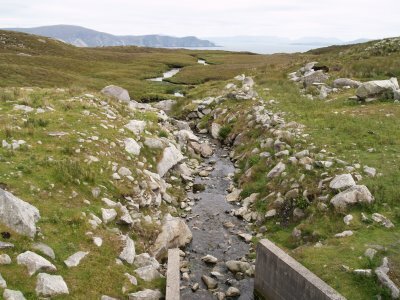 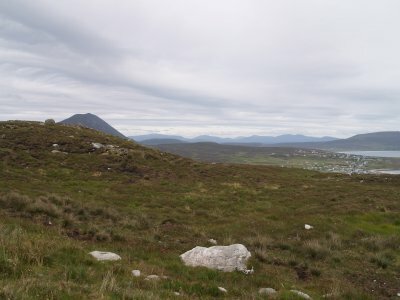 The lake supplies Achill Island with its fresh water supply. 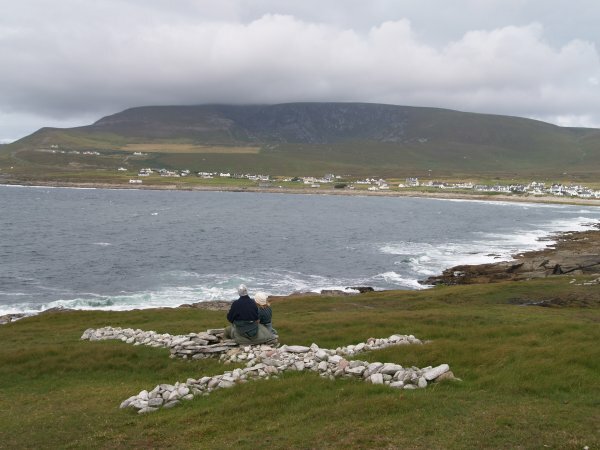 A decent picnic spot with views up to the mountains and down to the sea.